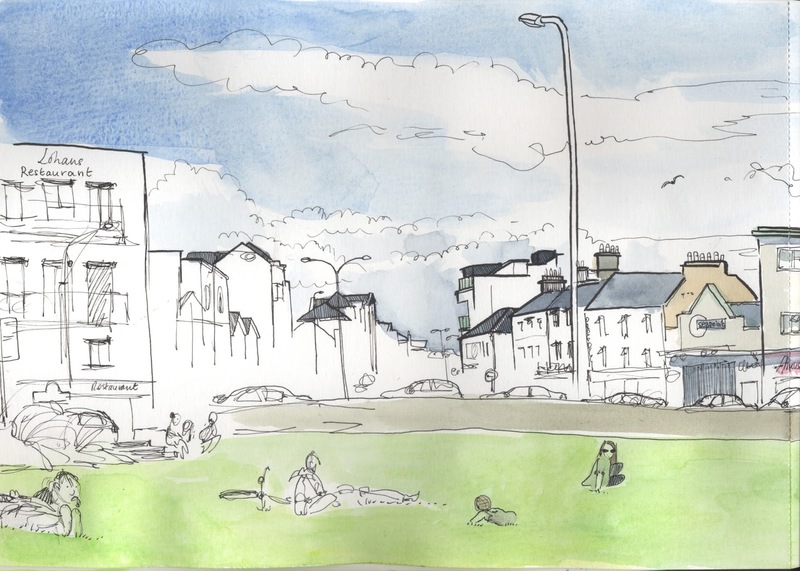 I was looking forward to this first Urban Sketchers Galway sketch-out all month. 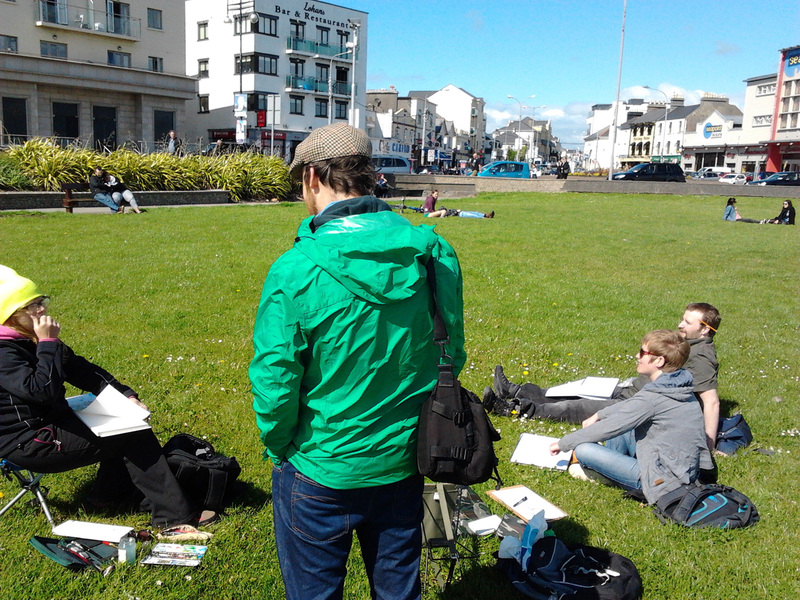 The week started off with Galway looking like a dreamland, in a way that a sunny May in rural Ireland can be. All week, I had spent days and evenings drawing; Monday in a copse down a country road with bumble bees around me and birds singing their hearts out; Tuesday looking over the bay at Killeenaran with seagulls letting the breeze carry them; Thursday in Gort, in a sunny town square, chatting to locals, and on Friday, hidden in the bushes like a paparazzo, sitting deep in a flowerbed, painting a client's house. Bliss. I tweeted that if Sunday was half as nice as any of those days, we were in for a treat. But that tweet was a lie...sort of. I knew that the weather was going to be rotten, as it was promised windy and rainy. 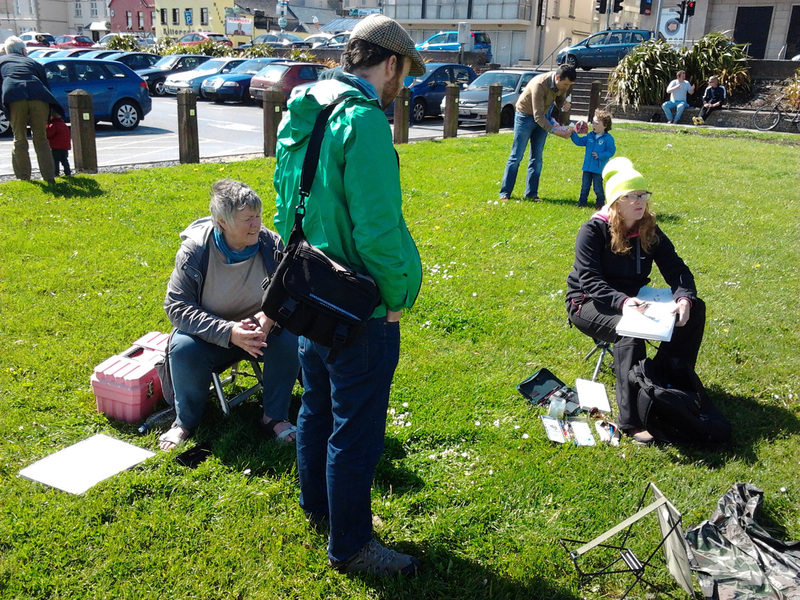 I was so disappointed as I had tried to spread the word about our sketch-out as much as I could, and Donal and a friend of his had made some super flyers which they'd passed around Galway. Now it looked like it would be a wash out. Miracles do happen, though...the weather guys were WRONG! 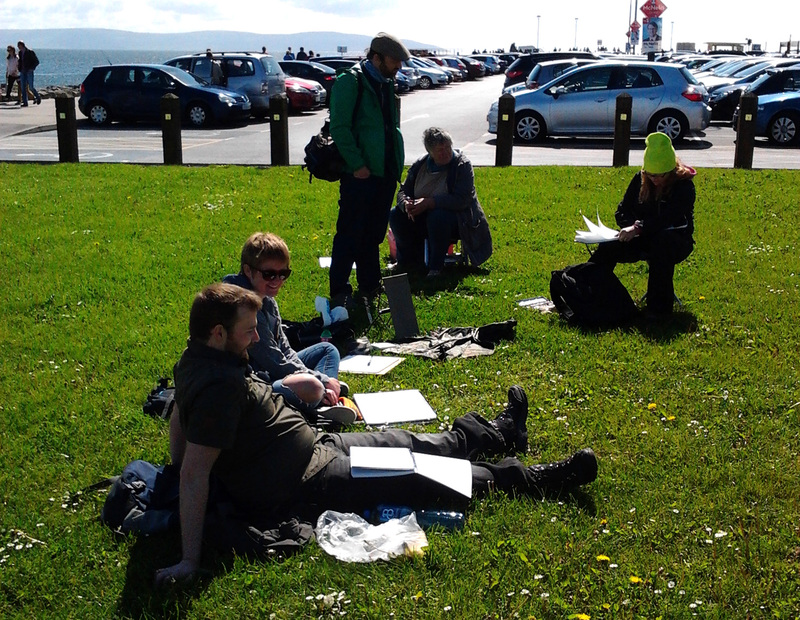 The sun shone for us and made our day a roaring success. Here we see Patrick on the left with Ruth beside him. Ruth, like me, is a geologist who loves to draw. 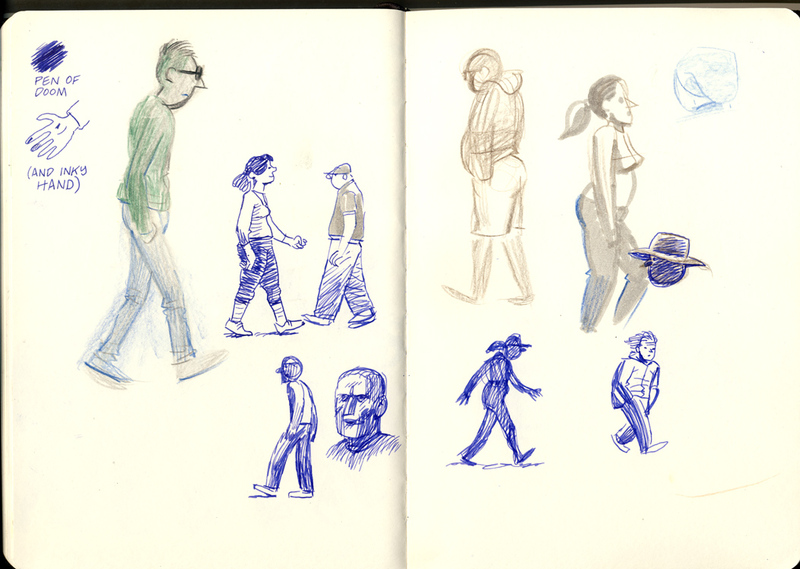 The seventh sketcher was Carmel but she managed to avoid the camera! You can see the Burren in Co. Clare across the bay. If you've seen The Shire in seen the Lord of the Rings movies, then you have a fair idea of the countryside around there...apparently Tolkein spent time in the Burren before he wrote his books and some of the names of his characters were inspired by old Irish names from the area. But back to Sunday. That gent in the navy jacket that you can see in the background is Walking The Prom. This is a Galway tradition and every day you will see what appears to be half the city marching up and down along the prom, which is 2km long. It runs from the heart of Galway City all the way out to the very edge of the city, just before Barna. You can see Galway Bay strecthing out beside you and there is a sandy beach the entire length of the Prom which is full of people enjoying the sand and the beautiful Atlantic Ocean from the inside. Women storm up and down the Prom in groups, arms swinging, sunglasses on. They kick the wall at the end in case they think they may not have "done" the whole Prom. The first time I saw that I thought it was a set up, but it's just Galway women doing their thing. Even though I scoffed, there's no point fighting it - I kicked it too in the end. 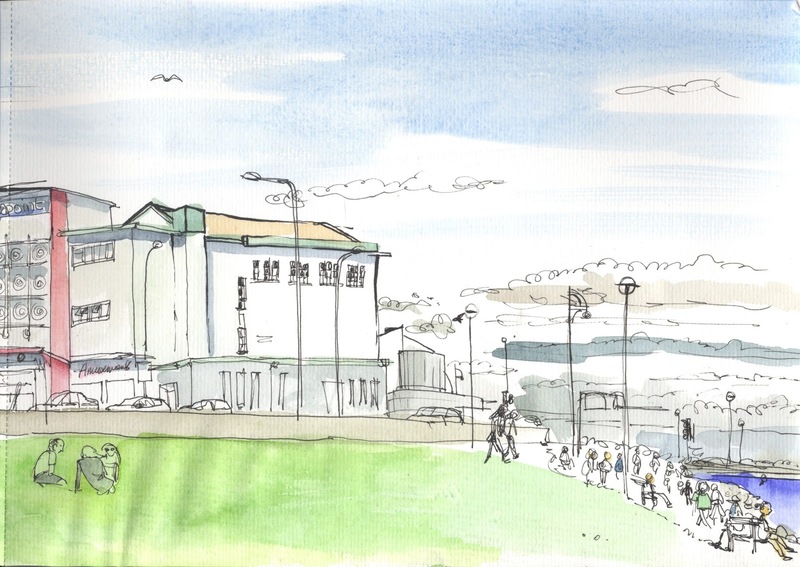 Here's another sketch by Phil, with a nice sketch of Seapoint, where there is an amusements (and I think apartments above). I like that pregnant lady. In this pic you can see the road leading up through Salthill. The street is called Upper Salthill. Descriptive. It is full of amusement arcades, ice cream parlours, pizzerias, chippers and shops where you can buy giant inflatable dolphins in case you've had an urge to visit the beach and have forgotten your giant inflatable dolphin. Jay was great with the photos - thanks man! 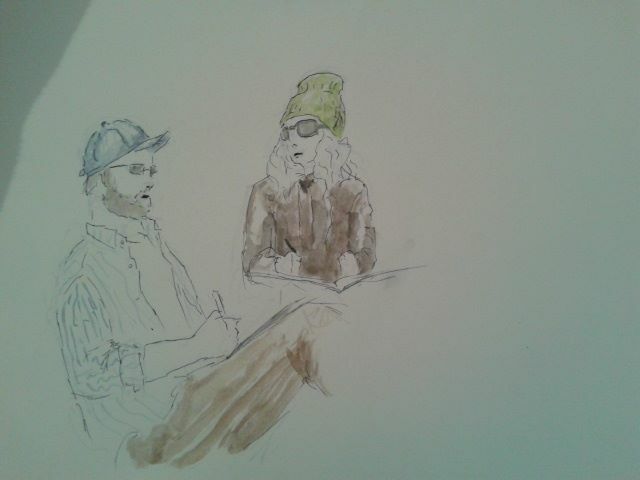 Here's Ruth's drawing of him...with me in my day-glo hat. 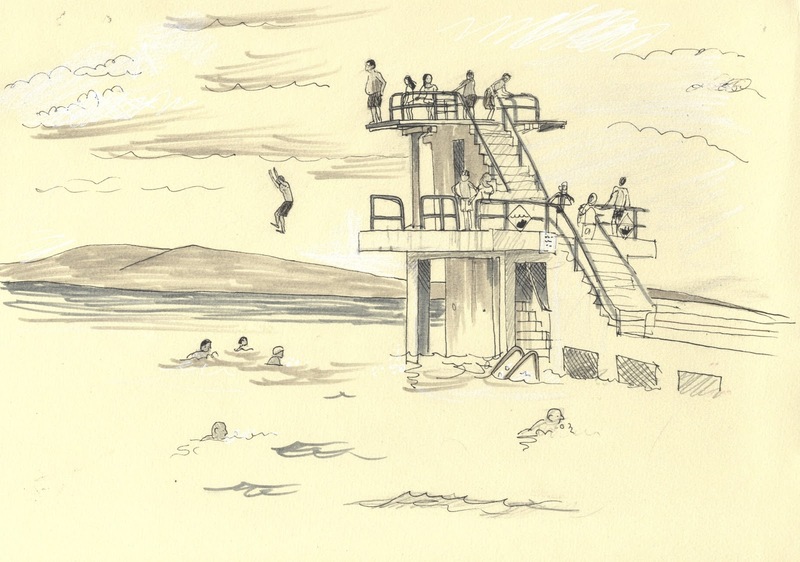 And here is Jay's drawing of Upper Salthill - what a beautiful sky. It's a panoramic view, drawn over two pages, so I can't fit in it...here's (most) of the rest of it, with Galway Bay just visible on the right. So here's to many more - if you can join us next time, we'd love to see you. Anyone at all! Visitors to the city, you're welcome! Galwgians and non-Galwegians alike, come on down. 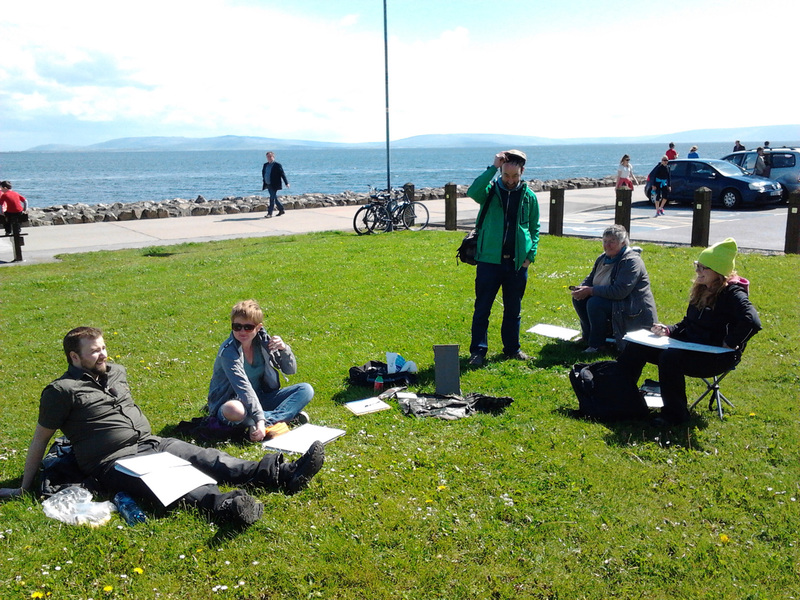 We are planning to celebrate our new Urban Sketchers Galway status with a cup of tea...Phil thinks we should smash it off a boat...Now THAT would be something to draw!! Saturday night and you're driving along country roads lined with hedgrows on steroids - they're basically Godzillas of hedges and wild flowers, exploding with life. Everything is intense green. In the dusk you see a most unprepossessing building with a green door. It's Ballinderreen Community Centre, in deepest South Galway, home of movie screenings of hurling matches, zumba and pilates classes, visits from Santy in December and Easter egg hunts in April. But last Saturday it held a most unusual trio. They are three of the most amazing musicians I've heard, and were joined by a special guest with a voice of honey. 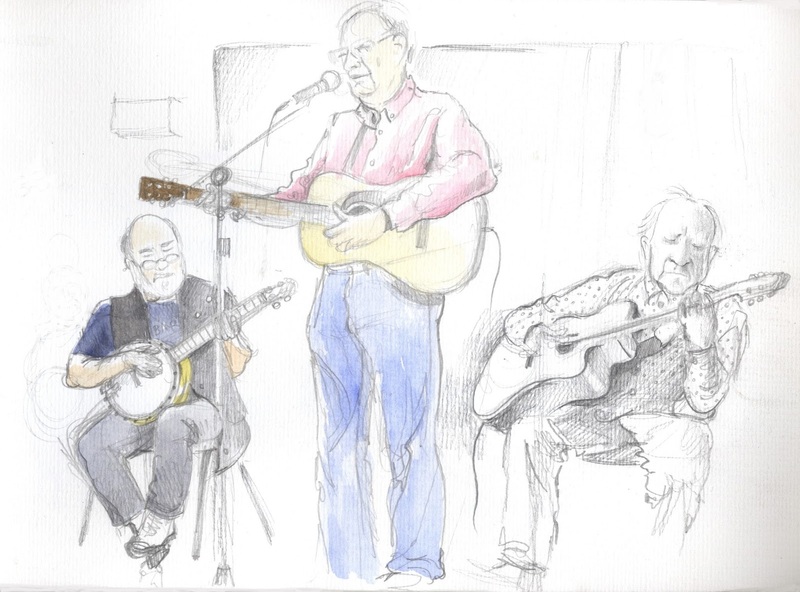 The musicians were Mick Daly on banjo and vocals, Jim Rooney on guitar and vocals and Arty McGlynn on guitar and vocals. The special guest was Seán Keane, and anyone who has heard him sing the May Morning Dew knows what it means to come from rural Ireland. Jim Rooney has lived music all his life, and is a folk singer in the vein of Hank Williams, Pete Seeger and others, and has produced Nanci Griffiths and many more; Mick Daly sings so beautifully, plays banjo like he was born to it and has been a fixture on the traditional Irish music scene for forty years, and Arty McGlynn, traditional Irish music royalty, plays sweet and gentle and makes your heart stir with passion with his guitar when it resonates so deeply. Jim and his wife Carol have spent the best part of twenty summers here in Killeenaran, but have recently returned to live in the States permanently. He's just published his memoir, In It For The Long Run, and he was launching it before the concert on Saturday night. Early last Tuesday morning, five days before the concert, there was a knock at my door. It was Mattie Larkin, a neighbour of Jim's in Killeenaran. "Would you paint something for Jim Rooney?" asked Mattie. "We want to make a presentation to him on Saturday night at the concert. I know it's short notice..."
"I'd be delighted to," I said. "I've just finished a job, I'm gasping to get out of here and it's a beautiful day." I run an illustrated wedding invitation business, and by that Tuesday morning I had been sticking invitations together for 72 hours, taking breaks only to eat, sleep and do things mothers have to do with kids at weekends. The floor of my studio was littered with the leavings of 180 invitations' worth of double-sided sticky tape, most of which seemed to have missed the bin. My fingers were sore from folding and tacky from glue and I had just packed up the last invitation when Mattie arrived. 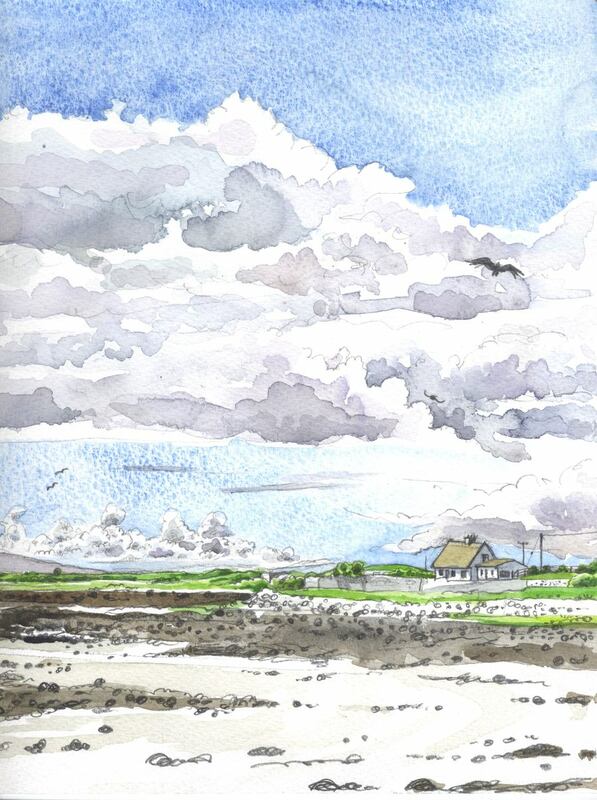 We knew just what to paint - Jim must have walked along the road that leads to Killeenaran Pier about a million times. 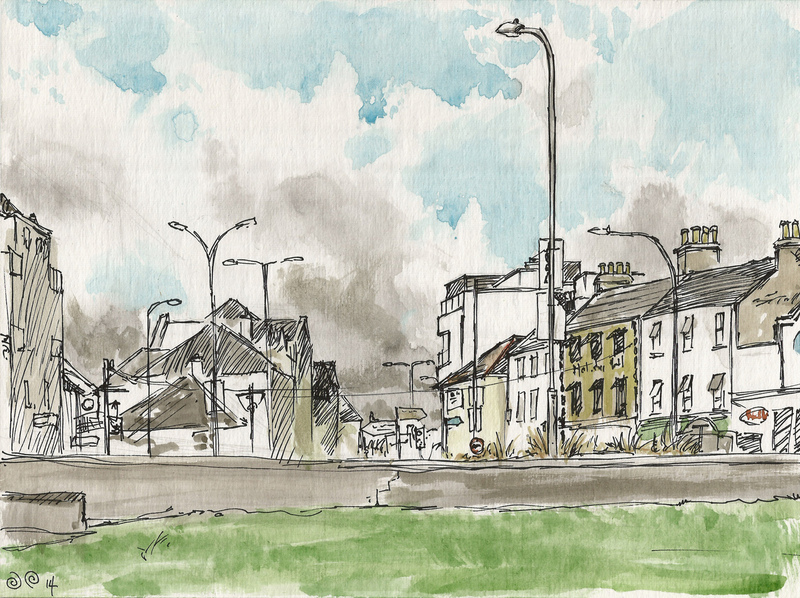 I spent the next few hours in wind and sun painting the beautiful bay at the top of the road leading down to the pier. 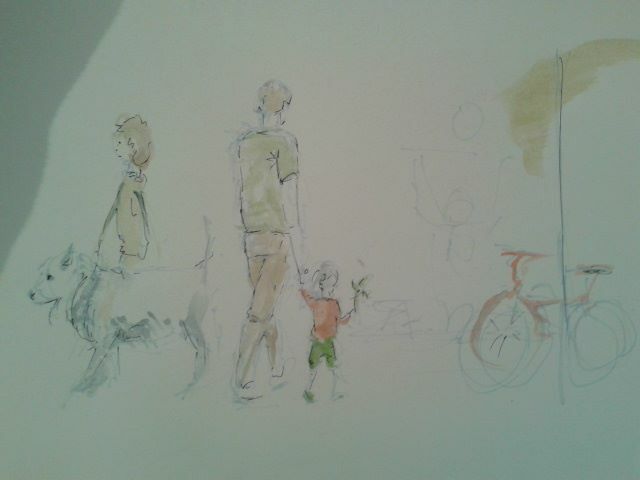 I'm getting more splashy and less particular as a watercolourist, thanks to the years of urban sketching, because you're frequently under pressure to fire off a drawing in ten or fifteen minutes. Part of the deal was a pair of tickets to the concert, which I had been planning on going to anyway. Besides, I am completely addicted to sitting out with my paints with nothing but the sky for a ceiling, so I couldn't have been happier. My friend Andrea Lippert lives quite close to me down another beautiful country road, and she makes beautiful frames, so I was thrilled when she reckoned she could just about squeeze in a frame for the painting before Saturday. The concert opened up with a group of local musicians, Sue Fahy on fiddle, Ellen and Mary Wiseman on guitar and vocals and Fintan O'Malley on percussion. Ellen sang All Of Me and the hairs stood up on the back of my neck. Here are Sue and Mary - I didn't get the others in, which is a pity! 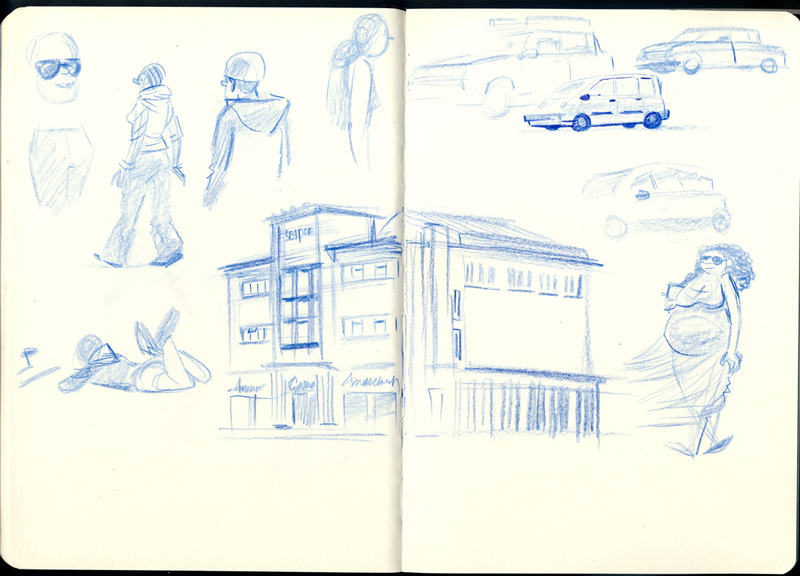 Now, I've drawn in lots of places. I'm not shy, and I stopped feeling self-conscious about drawing in public years ago. But for some reason I was self-conscious as I drew these ladies. It may have been the fact that I was in the front row, just a few feet in front of them, or perhaps because I wasn't sure whether they knew I'd be drawing them, or maybe because I was the only one drawing in a room full of people sitting in rows behind and to either side of me. But my husband said to me quietly that I'd better get used to overcoming that...so I just drew. 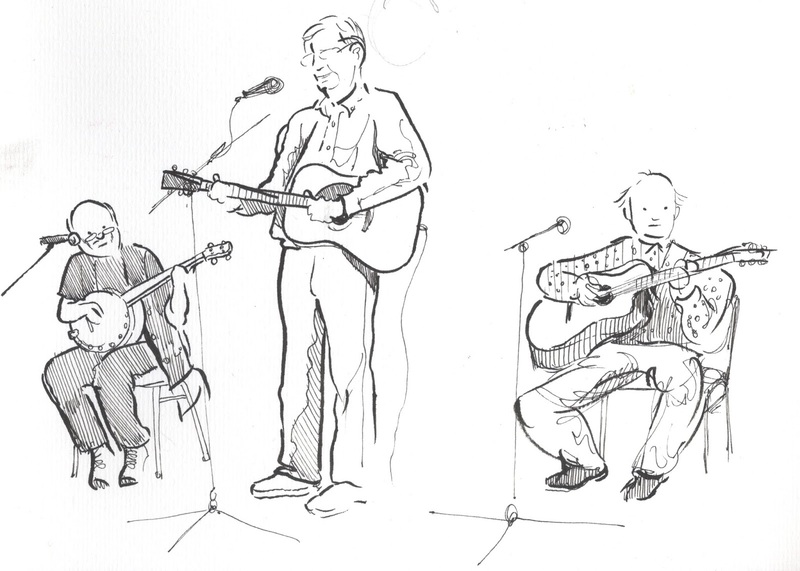 After these lovely musicians entertained us for a while, Jim, Mick and Arty took the stage. I don't know how often they play such a small venue - the Community Centre can't possibly hold more than about a hundred. 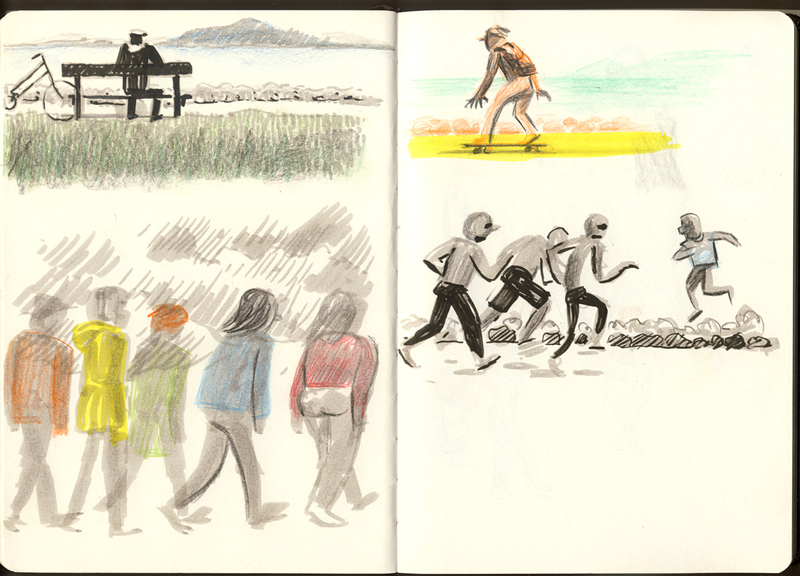 The music began and i was swept away, but I kept my wits about me long enough to draw them. Does anyone have any tips for drawing hands changing chords really fast? I drew carefully, in pencil, and that's the drawing at the top of the page. It's a good way to draw if you're keen to catch a good likeness because you can fix mistakes, but it's not really my medium of choice these days. I'm a BOLD STROKES type person and I love to use a pen, with a devil-may-care attitude to mistakes. I have to admit I prefer this one...you just can't beat a brush pen with a Platinum Carbon pen for a bit of cross-hatching. 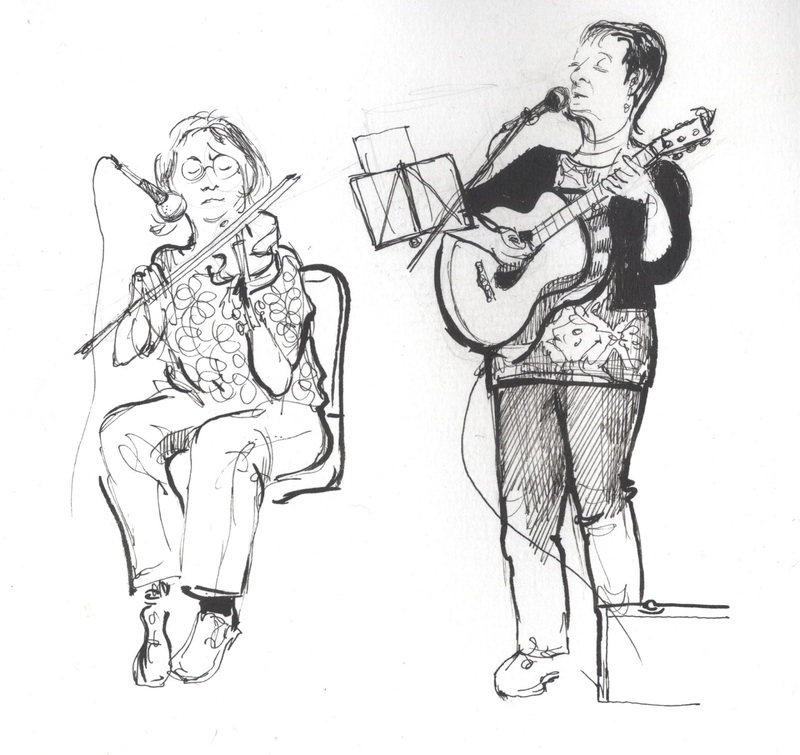 I had been longing to draw musicians for ages and I wasn't disappointed. I would love more gigs along these lines, it's a lovely way to be present. Four and a half hours after my husband and I arrived in the Community Centre in Ballinderreen, we were sorry to have to leave, full of tea and scones and the warmth of sharing music with our lovely neighbours. The weather had broken and it was pouring rain. I stood in the doorway with another lady whose husband, like mine, had gone to get the car. We smiled at each other, obviously both feeling a bit guilty. "Sure that's what husbands are for," she said. Afterwards, I thought about Jim, who became very emotional during the concert as he reflected on his long and happy life of love and music. "I've been so very blessed," he said. And I thought about painting in the sun and wind, and surrounded by beautiful music, and I thought how blessed I am too.